﻿ "Los Angeles comic part of Asian Awareness Month." November 14, 1994. 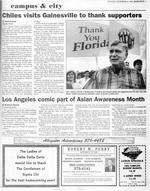 "Los Angeles comic part of Asian Awareness Month." November 14, 1994. MONDAY,NOVEMBER14,1994,ALLIGATOR, 3eampus & eityKevin Krausegator Writeriles visits Gaineanksupporters ANDRE CHARBONNEAUGov. Chiles arrived in Gainesville Thursday morningtothankhis supportersforhiswinoverJebBush. Chiles received2,125,984votestoBush's2,051,407.villetotmoving." Chiles cited as top priorities, "taking care of our children," health care,welfare reform and juvenile justice. ''We have some bad kidswehavetolock up,"hesaid. "Andwehave a lot of kids at risk whowewant to keep from being bad kids." State AttorneyRodSmith greeted Chiles and later saidhewas excited about the chance to help serve himindealing with crime, especially involv ing young offenders. ''The governor has always beenforward-thinkinginthat area," Smith said. "Ithink he'll do a great job." While surprised motorists had tolooktwiceatthegovernor,who blended into the crowd dressed in slacks and a plaid oxford, a group of third gradersgotthe biggest kick out of meeting Chiles. One boy from Littlewood ElementarySchool wanted to know what Chileswilldo for elementary schools. ''We're going to make them better," Chiles responded. "We're goingtogive the parents and the teachers a lot more say so. We want togetyour parents involved." Beforeheadingfor Jacksonville, Chiles said he always has had a special affection for Alachua County. "Ifeel like I've lived here half ofmylife," said Chiles, who received under graduate and law degrees fromUFo"It's Gator Country. We at home here. "Gov.Lawton Chiles campaignedin. esville one day before last Tues's general election and returned ursday morning to thank those whoIpedre-elect him. Chiles was greeted by about50peo at the corner of University Avenue d 34th Street. The stop was part of o-day, statewide trip thank sup rters.Inwhat admittedly was his closeste,Chiles defeated Republican chal 'nger Jeb Bush and survived thenanwide ousting of Democratic incum nts. In additiontotheU.S.Congress, epublicans gained control of the Flora Legislature on election day. Chiles made his way through the cited group, shaking hands, auto aphing campaign signs and waving o passing cars amidst a chorus of onking horns. Chiles, whose political career has panned36years, said he was eager o begin his second and last term as overnor and to work with Republican aders in the state Senate to "build on hatwestarted with." "I'm glad the election is over. Now e have to start governing again," hiles said, adding that Republican leaders in Tallahassee nowwillhavetoshare the responsibility of govern ing. "People are really tired of gridlock, and they want us togetsomethingosAngeles comic part of Asian Awareness MonthBy Branwen SantosContributing WriterAsone of the acts in the Asian Kaleido cope Month, ChristyL.Medrano, a young, hip comedienne/actress from Los Angeles, promises more than a giggle. This24year-old Asian American, who has been featured on MTV's "Rock the Vote" advertisement,willperform live at theOrange&Brew tonight at 8:30. Medrano saysherbrand of comedy is silliness. "I think comedy is something to laugh at," said Medrano, who has been a featured actress on "In Living Color." "It keeps you leveled.Itkeeps everybody leveled after they have a big laugh." While Medrano's goal istomake people laugh, she saidherstyle is different from other comedians. "Ihavemyviewpoints and Iwillshare them,butI'm not goingtobe like Dennis Leary and shove it down people's throats." Medrano has performed at many venues, including the University of California at Los Angeles. In New York, Medrano has performed at the New York Comedy Club, Stand-Up New York and the Comic Strip. In California, she was a member of the "Funny Ladies of Color," an ethnic women's comedy group. She also has performed at the Improvisation, Punchline and Laugh Fac tory. Patrick Baterna, co-director of AsianKaleidoscope Month, said he feels that Me drano's show is one of the more important acts for this cultural month. "We wanted more (activities)ina month becausewedidn't want the entire culture to be 'a fashion show.' Baterna said. ''What-is important is not only covering that part of the culture through comedy, it'diplaying our culture through humor and entertain ment." Glenn Fajardo, chairman of the Asian Stu dent Union, said he thinksherstyle of comedy brings out social issues. "Imean she's not preachy or anything like that," Fajardo said. "She doesn't tell you what to think. It's just that she raises issuesina funny,butsobering manner." Medrano knows that withherethnic back ground not everyonewillgetherjokes,butshe said she has confidence thatshecan make people aware of certain social issues. "Ihope I don't meet a lot of opposition," Medrano said. "I'm Filipino, and of coursemyexperi enceswillbe of Filipino descent.Asa comic, you know how to bridge itand how to make it (the humor) be able to speak to all races. "ATIORNEYATLAWLUNCH SPECIALSWeekdays11am-4pmTWOCOMPLmBURGERBASKETS$4.95or6JUMBOWINGS$1.501376-1667 1728 W.Univ. Ave.L.Dineinonly.J--------r--------,o "" PERRYROBERTM. '''The hiring of a lawyer is an important decision that should not be based solely upon advertisements. Written information concerning qualifications and experiencewillbe provided upon request. "No feesorcostsunlessarecoveryismadeforyou.1330N.W.6th Street, Suite AProviding Representation In Cases Arising From:BICYCLEACCIDETS -AUTOACCIDETS PREMISES LIABILITY -EGLIGET SECURITYFREECONSULTATION373-4141TheLadiesofDeltaDeltaDeltawouldliketothankTheGentlemenof Sigma Chiforthebest homecoming ever!